Stamp Scrap Fever! : Stocking Stuffers! I love Christmas. Besides looking forward to seeing family, shopping, eating, partying and honoring the birth of Jesus, it's also a great time to be a paper crafter. I get to design and make my own Christmas cards. I love sending out cards that mean more to me than a pretty picture and a pretty saying. I know that not all recipients appreciate the time and effort it takes to make my cards, but the process of making them and thinking about the friends and family I'll be sending them to is very important to me, a tradition I adore. 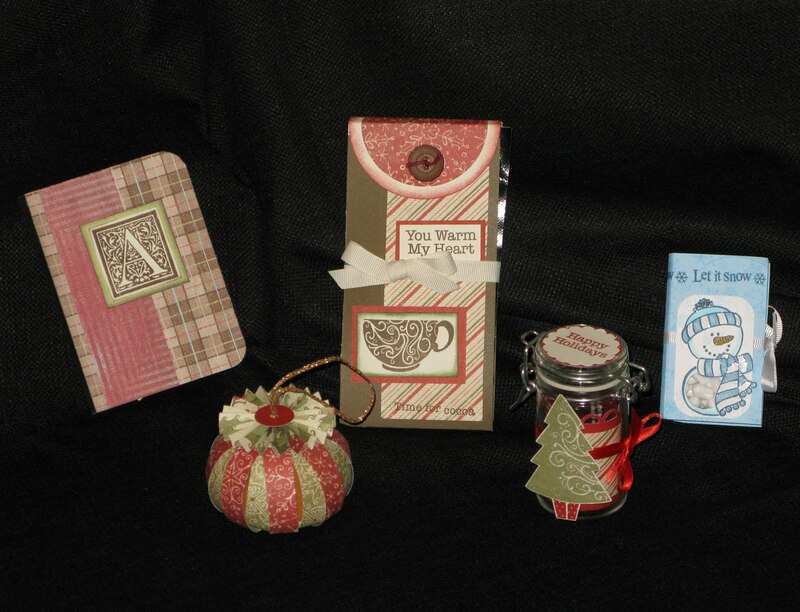 Besides making cards there are so many other holiday things to make by paper crafting. I'm certainly not as creative as so many of the crafters I admire, but I do have fun! This photo is of five items we are creating in my next workshop. They can be small gifts for people you want to acknowledge with a little something or they can be stocking stuffers, or perhaps, like the ornament or notebook, you can keep it for yourself. However they are used, they are sure to be appreciated! Let the holidays begin! I so love this season! !